Maybe a stupid question but the price of the AE token will this allways be the same as the AE coin price? I can imagine after mainnet nobody wants to buy the AE token anymore? So this means normally a price drop when people wants to sell them through a exchange? The price of AE currency will probably wants to rise due to market demands? How does this work? Is the price the same for both or is this gonna change? Can somebody explain? The most common cause of this is low gas fee. Please try to run your transaction data through our verify tool. To do this, copy your payload data om the screen before the one you posted and send it to us. 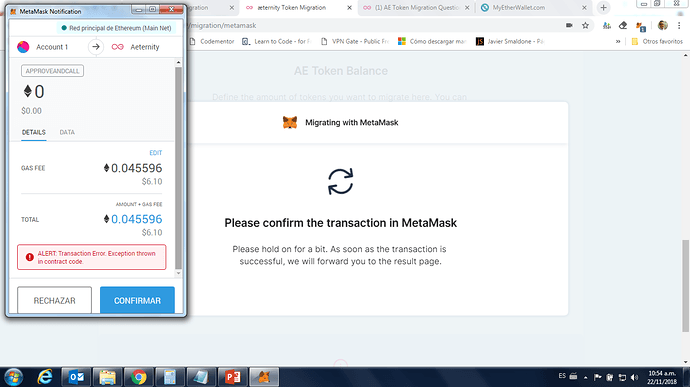 Running verification process: result OK, by other side, I’ve ETH 0.0595 in Ethereum wallet where are stored AE Tokens and ETH 0.0668 in Ethereum wallet in MetaMask, how much is neccesary? Our devs think that everything looks fine and there is no reason for this error. So the only thing we can suggest at this moment is for you to log out of MetaMask and log in again or to use MEW. Please try and let us know how it went. I follow your indications, it work perfect with MEW. Thank you so much! Hi, AE token price should go up, remember that the migration process will continue until next year. Any news if at least the top exchanges like binance will support the swap? This would be just the best option for many users in my opinion. No info concerning Binance yet, but we have created a list of exchanges that support the Mainnet AE token and we update it regularly - find it here. I have a problem with the U2F message. 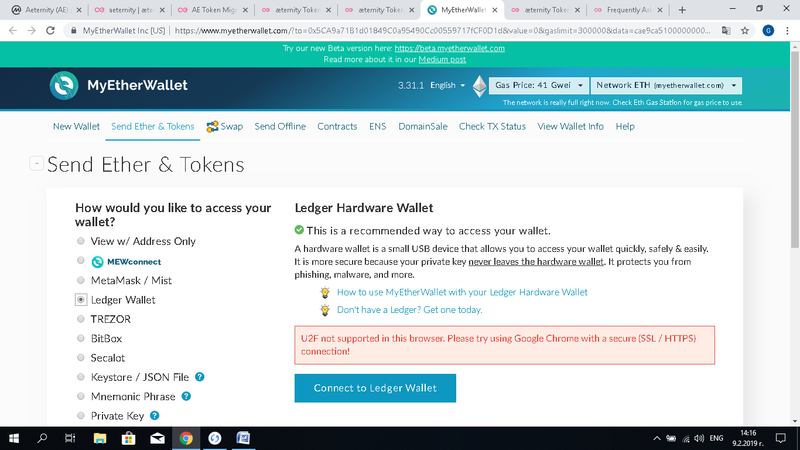 I use a Chrome browser, but I can not unlock my wallet at www.myetherwallet.com. I do exactly the same steps as the clip that is for tokens migration, but I go to unlocking the wallet. I apply picture as proof. Below I’m sending you a transaction proving the availability of my AE tokens in Ledger Wallet. Please report their availability and give me instructions on how to transfer them to your new blockchain / migration /. Is it likely to lose them for some reason? Defintely do not continue with the migration if you get an error message. I would suggest to access the LEdger wallet through MetaMask on Chrome. I have some problems with the migration via MEW. My MEW is secured with a digitalbitbox. After i create the migration transaction i get re-directed to MEW as i should. Then i have to unlock my MEW wallet via the bitbox. Here is were i get a problem. The migration link disappears and in get routed to the regular MEW Digitalbitbox main login page. I have tried the tip of using the "vintage.MEW site. This does not work, because it will not unlock my MEW. Does anyone have an idea how to migrate my tokens? Seems that MyEtherWallet have upgraded their web application, and seems they don’t support the URL building / Sending Transactions through the new MEW. Like you mentioned, using vintage opens up the old MEW, and it seems you have trouble with it as well. We have sent an email to MEW team and see how we can fix this issue. I’ll try to update you further. For now, if you’re in a hurry, I would suggest to try vintage once more, and see what might be the issue, since there is a chance that it is an issue with the U2F protocol that connects with your hardware device. I’m not in a hurry, so i will wait for your update or a fix at MEW. Bear in mind that Phase 1 of AE token migration ends tomorrow so you may want to consider other ways to transfer your tokens. We can’t guarantee whether there would be a fix to the MEW issue by tomorrow. 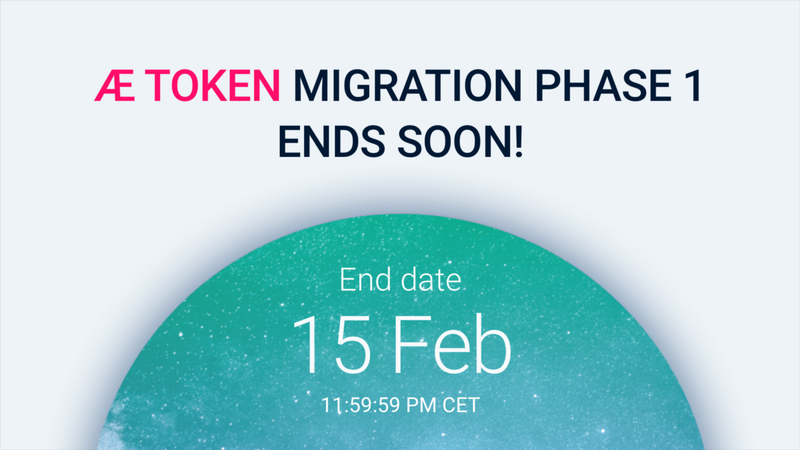 As the first scheduled fork is drawing near, we would like to announce some important details related to AE token migration. Read this! I succeed to migrate via Gate.io exchange in real-time. Deposit ERC20 token, and then withdraw Aeternity mainnet coin immediately. But be careful, Gate may require you be verified to withdraw money.